When over 23,000 clay cuneiform tablets were found in the excavations of the Assyrian Royal Library of Ashurbanipal in ancient Nineveh, their relevance to the nation of Israel was initially overlooked. This was undoubtedly because they were in complete disorder and among hundreds of miscellaneous texts dealing with many matters of State. Contributing to this oversight was the fact that the Assyrians called the Israelites by different names during their captivity. Some of the tablets found were dated around 707 B.C. and reveal the fate of the Israelites as they escaped from the land of their captivity and "disappeared" into the hinterland of Europe. 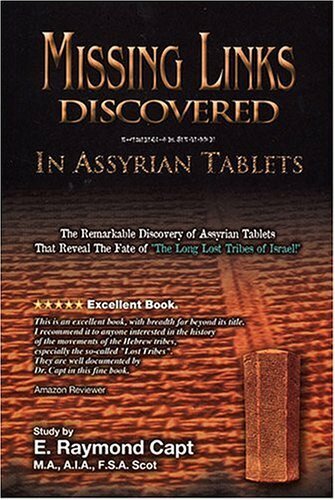 These tablets form the "Missing Links" that enable us to identify the modern-day descendants of the "Lost Tribes of Israel". In doing so, we increase our knowledge of Bible history and experience a dramatic revision of our pre-conceived ideas of Bible prophecy. In this authoritative book, the author reviews the origin and history of the Israelites; surveys the Assyrian inscriptions and cuneiform tablets that record the deportations of Israel as they relate to Biblical and secular history; discusses their sojourn in captivity, and provides a synopsis of their migrations to their new homelands. Other authors fill in the details.